Supervisory Skills: BOOTCAMP is a comprehensive training program designed to address the areas that affect Nevada businesses the most. This one-day intensive training bootcamp covers the essentials—what supervisors/managers need to know to mitigate the risks of running a business and managing employees. At the conclusion of the training bootcamp, participants will have greater insight into their roles as supervisors/managers within the organization, a deeper understanding of the laws applicable to employers in Nevada, and best practices in dealing with some of the most difficult situations supervisors/managers face. Supervisory Skills: BOOTCAMP is designed for current supervisors/managers, newer HR professionals, small business owners, and anyone else who would like a better understanding of the rights and obligations of being an employer in Nevada. Topics covered in this intensive training bootcamp include employment law, workplace harassment, wage and hour, discipline and discharge, and reasonable suspicion. Space is LIMITED. Register before the class is full! 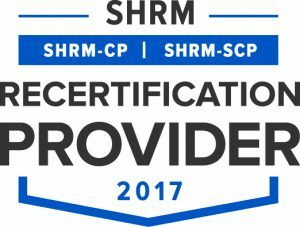 This program is approved for 5 HR (General) recertification credit hours toward aPHR™, PHR®, PHRca®, SPHR®, GPHR®, PHRi™ and SPHRi™ recertification through HRCI.